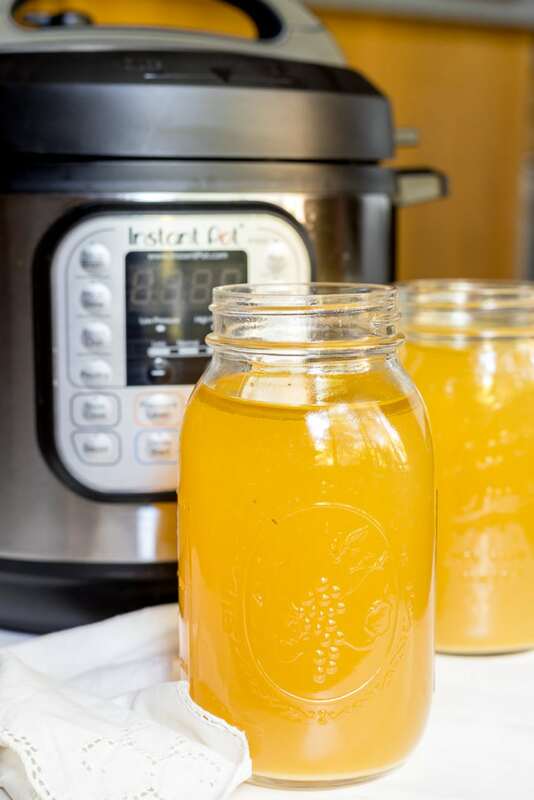 Chicken Bone Broth in an Instant Pot is quick and easy! 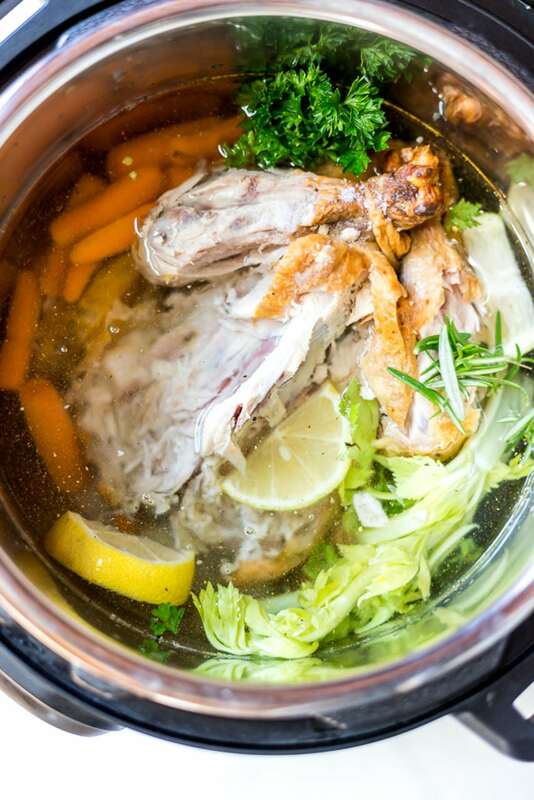 If you don’t have an Instant Pot Pressure Cooker yet, no worries, check out my Slow Cooker Chicken Stock Recipe. I was a hold out when it came to Instant Pot cooking. I always try to avoid adding more cooking devices into my kitchen and also the whole exploding pressure cooker thing 💣 Apparently that is not even a thing, especially nowadays. I have barely scratched the surface with my Instant Pot abilities. I have yet to try it for yogurt making or even rice cooking. But I started with the most important, imho, homemade bone broth! 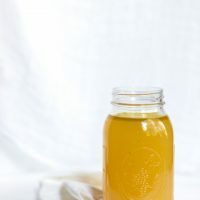 Homemade Chicken Bone Broth is as easy as tossing a chicken carcass and whatever else you want into the pressure cooker, covering with water then set it to do its thang. First make this Easy Oven Roast Chicken so that you have the necessary ingredient for this broth. Whenever I make a roasted chicken I plan on making broth the next day. What are the Bone Broth Benefits? Legit bone broth is known for its collagen and minerals. When we throw away meaty bones we are literally tossing out excellent nutrient sources with the trash. 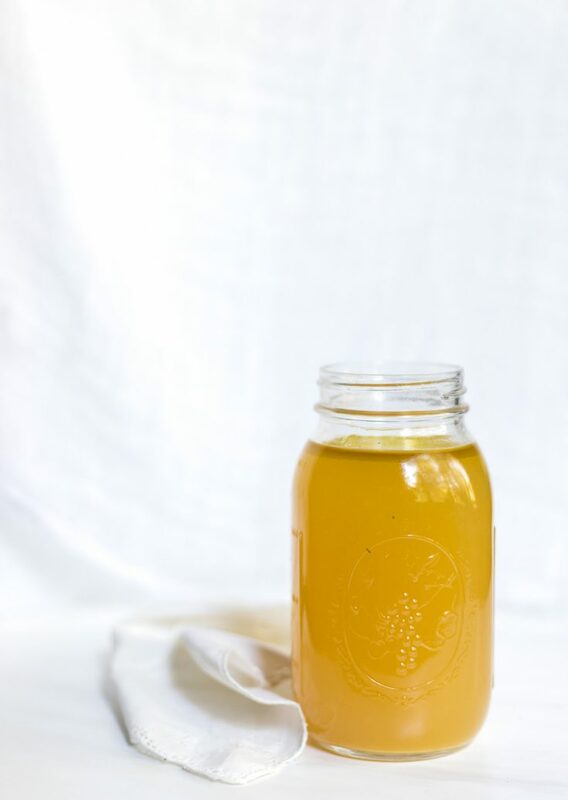 Bone broth has been linked to gut health, improved digestion and helping with joint pain. The joint pain is why I first began adding broth to my diet. I tried the collagen powders but had some adverse reactions and they did not help me like real liquid broth. Another big perk of collagen is that it helps your hair, skin and nails. So if you’re always on the lookout for effective beauty habits (like me) this is definitely something to add to your routine. 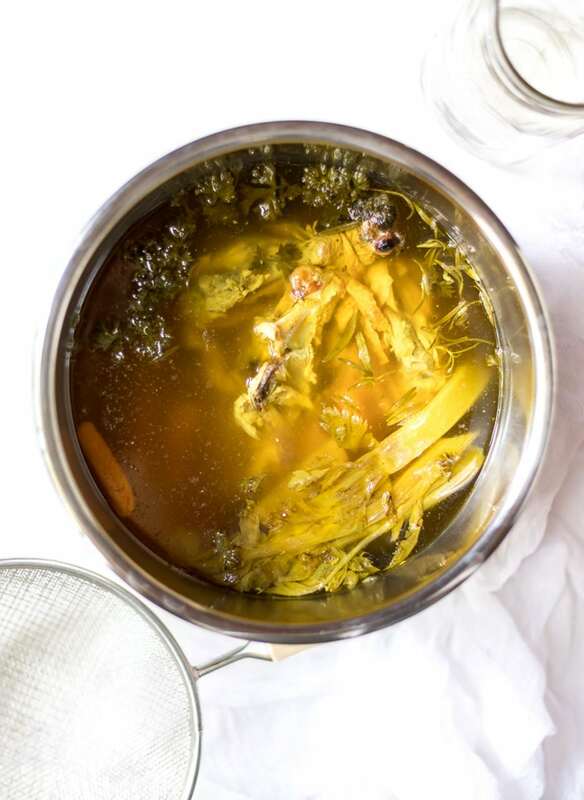 What should you add to your broth besides a leftover roasted chicken and water? That is up to you. I added carrots, celery, garlic, rosemary, parsley, lemon, turmeric and dried ginger to this batch. But my usual basics are lemon, fresh ginger, parsley and garlic. This is where you can add your preferred flavors or desired herbs and spices for health benefits. How do you get a gloriously golden (non-murky) broth? Strain It! I use a fine mesh multi layered strainer that works great. If you want pure liquid only, you can use a cheesecloth to strain the stock. How do you store the broth? I like to store my broth in large glass jars. This recipe makes 8-9 cups of broth so I refrigerate half the batch and use within 3-4 days and freeze the other half. Well, obviously you will need a pressure cooker like this 6 Qt Instant Pot. You will also want a Mesh Strainer or Cheesecloth and Glass Jars. How should you use your broth? I personally like to sip on a mug of hot broth. But that’s not for everybody so here are a few recipes to use that golden delicious broth → Slow Cooker Cabbage Roll Soup, DF Garlic Mashed Potatoes, Creamy Chicken Rice Soup, Cheesy Chicken Broccoli Rice Casserole or Stuffed Cabbage Casserole. Place chicken, salt, pepper, vinegar and any other add-in ingredients into 6 quart pressure cooker. Cover with water until just under max fill line (about 8-9 cups). Seal lid and valve. Cook on high pressure for 1 hour and 20 minutes. Allow the pressure to naturally release. Once depressurized, remove large pieces from stock using a slotted spoon. Strain stock through a double mesh strainer or cheesecloth. 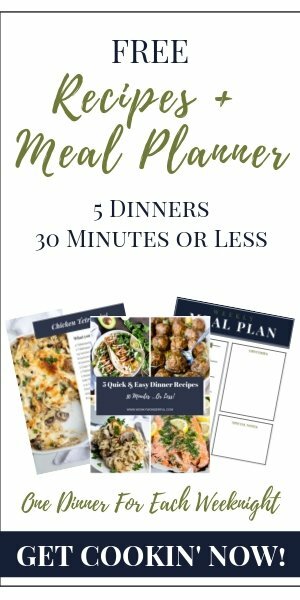 Refrigerate and use within 3-4 days or freeze. Do you have any uses for the veggies left over from cooking the broth? Can you eat them? I personally have never used them. I imagine they are edible but probably not too tasty and really, really mushy. Do you freeze the broth in the glass jars also? And how long is it good in the fridge for? Do you use the juices that were created when roasting the chicken?